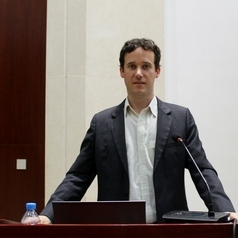 Nate is a political and environmental scientist whose principal interests lie in understanding and mitigating the impacts of political and economic change on people and the environment in developing countries. He has 15+ years of professional and fieldwork experience spanning 30 countries around the globe, primarily focused in Asia and Africa. The Global Resilience Partnership was founded by The Rockefeller Foundation, USAID and SIDA with an aim to help millions of vulnerable people better adapt to shocks and chronic stresses and invest in a more resilient future. Previously to this role, he was Global Research Coordinator and Flagship Leader of the US$36 million Integrating Ecosystems into Policy and Solutions Flagship for the Consultative Group on International Agricultural Research (CGIAR) Program on Water, Land and Ecosystems (WLE). Nate has published two books and over 40 peer reviewed publications covering environmental justice, forestry, agriculture, irrigation, hydropower, ecosystems services, resilience and the water-energy-food nexus. He has given dozens of senior level international talks. My focus is on interdisciplinary, systems and applied research (R4D). I seek to engage the end users of research at the beginning of the research process to develop impact. My current research revolves around the interconnected spheres of Water, Energy, Food and the Environment sometimes referred to as the Nexus. More specifically, I am interested in water, energy and food security and policy, ecosystem services and resilience, and sustainable intensification.